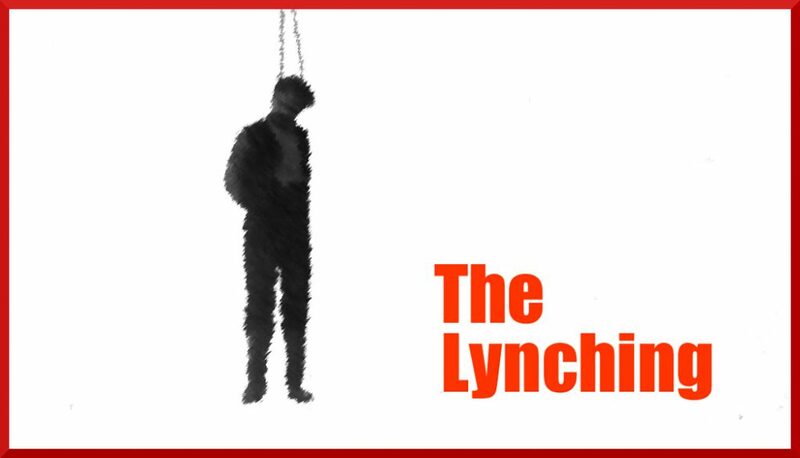 Sixteen lynchings have taken place in Wisconsin. The first occurred in Chippewa Falls in 1849 and the last in Darlington in 1891. With one exception (a man accused of “violence against his family”) each lynching victim was suspected of murder. Fourteen were white, two were Native American, and one, Marshal Clark of Milwaukee, African-American. On a Friday evening, September 6, 1861, Clark, 22 years old, was walking through the Third Ward with James Shelton, also African-American. They encountered two men of Irish descent, Darby Carney and John Brady. An argument ensued and escalated into a fight, in course of which Carney suffered a stab wound to his abdomen and Brady received a severe slash on his shoulder. Clark and Shelton fled, stabbing a bystander in the process but were soon captured and placed in jail, then located at the northern end of today’s Cathedral Square. The wounded Carney died the following night. Before his death, he told police Shelton had wielded the knife. Emotions were already running high in the predominantly Irish Third Ward. The fatal stabbing coincided with the one-year anniversary of the loss of the steamship Lady Elgin with more than 300 members of Irish community aboard. As word of Carney’s death spread, a mob quickly formed and marched to the jail, where Police Chief William Beck was waiting for them. The Milwaukee Police Department was just six years old and Beck was its first chief. Beck had immigrated from Germany as a child and worked as a New York City police detective and as a gold miner in California. Moving to the Milwaukee area, he took up farming but was soon hired to become the county’s first sheriff’s detective. In 1855, the Common Council created the Milwaukee Police Department and Beck was its unanimous choice for Chief of Police. As the mob approached, Beck told the handful of staff on duty to lock themselves inside and defend the prisoners. The jailer, a man named Kendrick, asked the chief if he should shoot rioters attempting to enter the jail. Beck replied they were not coming in except over his body. He then stood in the doorway with two policemen as the rioters – armed with weapons that ranged from pistols and knives to stones and lengths of lumber billets of wood – converged. One of the mob’s ringleaders pointed a revolver through the barred door at Jailer Kendrick and ordered him to open. Kendrick refused, saying they could shoot him if they wished, but the door would not be opened. Not wishing to shoot the officer, the crowd instead located an 18-foot timber beam and used it to batter through the heavy wood and iron door. Confined in a large room at the rear of the jail, Clark and Shelton heard the mob approaching. Shelton was able to hide as the crowd burst in, but Clark was spotted, dragged from the jail, and beaten until, as one history puts it, he was “more dead than alive.” He was taken to a fire station on East St. Paul Avenue and given a one-sided semblance of a trial. Charles Lynch of Virginia, a Quaker and Revolutionary War patriot, had arrested and punished civilian supporters of the British Army during the War of Independence. Although, as a county court judge he had no legal authority to do this, Lynch said wartime necessity justified his actions. His state was occupied by a hostile army at the time and its General Court – the one having jurisdiction – had been disbanded. In time “Lynch’s Law” became an umbrella term for common people assuming extrajudicial authority. For example, as pioneers moved deeper into the wilderness and farther from established courts, neighbors would band together to capture, try, and punish criminals preying on their remote communities. Given their circumstances, there was little else the settlers could do to protect themselves. But by the mid-nineteenth century, however, the concept had twisted into an excuse to justify mob terror. It is one of the ironies of history that the name of the courageous and scrupulously honorable Lynch became synonymous with murderous deeds. In the middle of Clark’s mockery of a trial, Milwaukee County Sheriff Charles Larkin arrived and attempted to persuade the mob to release Clark into his custody. Instead, the sheriff was told he would also hang if he interfered. Clark was then dragged through the Third Ward and hanged from a rope tied to a piledriver. Police Chief Beck also paid for the crime. Public indignation at the lynching led to his resignation. Regardless, of his trial’s outcome, James Shelton was in no danger of execution. The death penalty had been repealed in Wisconsin eight years earlier following a horrifically botched public execution. On a summer night in 1850, Bridgett McCaffary was drowned by her husband in a backyard cistern in Kenosha by her husband John McCaffery. He was arrested, charged with murder, and, on May 23, 1851, convicted and sentenced to death by hanging. Before the sentence was carried out, the newspaper reported McCaffary knelt in prayer with two members of the clergy. He then spoke to the crowd, saying he was the cause of the death of his wife and he hoped his fate would be a warning to both married and single men. A black hood was drawn over his face, a noose placed around his neck, and the trap door released. Instead of dying immediately of a broken neck, McCaffary hung writhing and kicking as the noose slowly strangled him. “His struggles continued apparently five minutes before life was entirely extinct,” the Sentinel reported. Sholes was elected the State Assembly and successfully led legislative efforts to end the death penalty. It was abolished in Wisconsin on July 12, 1853. McCaffary remains the only person legally executed in the state. Thanks – I’ve missed your posts! Thanks — I’ve been working on a side project, which is finally wrapped up. More posts are in the works! Good to see you writing about Milwaukee again, Carl! Another interesting tale from the early years of Milwaukee and Wisconsin, and thoroughly researched. Thanks Carl! This is what we should be seeing in the Journal Sentinel (i.e. USA Today) Green Sheet! Glad to have you back, I’ve been missing your posts! Thank you for sending this post to me. I love your site. This is so interesting! Thanks for a great post! I never knew where the term “lynch” came from before. It was also surprising to learn that of all the lynchings in Wisconsin, only one person was African-American. Wow. Good read. Very informative.